thedevotedwoman: whose counsel will you follow? whose wisdom will you seek? whose counsel will you follow? whose wisdom will you seek? You know, I receive so many letters requesting advice. So many questions asking how to live successfully and fully. Many of these requests come from women who are grasping at straws - struggling to find answers in their marriage, or in their singleness, or in their work, or in their present circumstance. And really, on my own, I have nothing to say to them. Personally, I hold no authority or advanced degree of certainty to answer anything about anything. In fact, I still have several questions of my own regarding the comings and goings of this life. Yes, alone I have nothing of significance to advise or offer anyone. But here's the good news... I know someone who does! I know my Jesus is able to teach and lead. I know the might of His Word and the strength of His Way. I know His forgiveness, His truth, His love, His redemption... I know He works! He fixes! He repairs and replenishes! I always get a kick out of how quickly God can bring peace and resolve when relentlessly sought after and faithfully followed. His wisdom allows for every man, woman and child to gain holy understanding and insight. His Word is beneficial for receiving instruction so that we may learn to do what is right and just and fair. He gives prudence and knowledge and discretion to anyone willing to listen. Yes, the fear of the LORD is the beginning of knowledge! So, why on earth do we still seek counsel elsewhere? Why aren't we using every opportunity to break open His book and share all He has to say? Why are we still choosing to live distracted, defeated, distorted and dismissive of the One who has the power to really, REALLY change us for the better? Let me be clear about a common misconception that exists even in our Christian circles. Self help is really no help at all. Human rational and psychology cannot counsel anyone back into wholeness or holiness. No, the answer to our problems does not lie in newly discovered and emotionally led revelations about who we invent ourselves into being while lying on a therapist's couch and exposing our deepest darkest secrets to yet another imperfect human being. Rather, the real Way, the real Truth, the real Life we crave to secure can only be found in One person... JESUS! 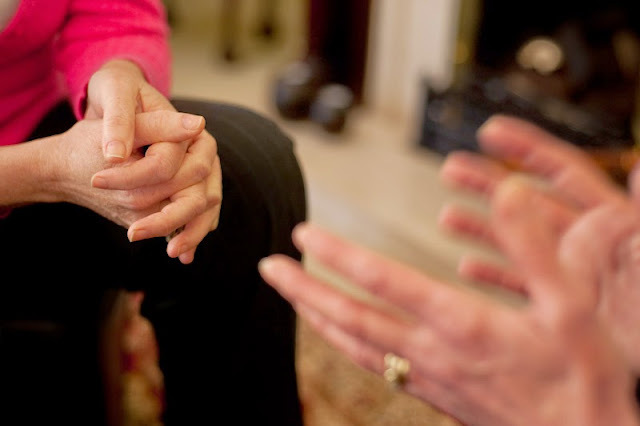 Many people do not realize that psychotherapy and even some forms of Christian counseling are needs-based. That means we are being told by other sinful humans that in order to find personal happiness, we must focus on our own level of self-esteem. But God's Word teaches us that it is not our self but God who changes our desires and determines our worth. In fact, true happiness can only be found in the desire for God and His godliness. People who need to rate and promote their own self-esteem and significance may find temporary happiness when they get what they want, but they will still remain self-centered... and thus remain unsatisfied and unholy. On the other hand, people who desire after God, His wisdom, and the glory of His throne will FOREVER be satisfied, joyous, obedient, and profitable. Hmmm, temporary happiness or eternal joy and satisfaction. Seems like a no-brainer, doesn't it? So whose counsel will you follow? Whose wisdom will you seek? God or man? Yes, we all have questions. We all seek to find real solutions as we maneuver through this sinful, tainted world. But if we are not seeking our answers from God's counsel first... if we are foolishly relying on human rational and/or human feelings to dictate the course of our ways, then we are walking down the wrong path and learning false truths from from false teachers. Instead, let's choose to fully equip ourselves with the wisdom of the Creator of all things. Let us be correctly trained in His truth and righteousness rather than seek after our own distorted versions of happiness. Why? Because He works! He fixes! He repairs and replenishes! So today, why not seek after God's wisdom? Why not submit over all selfish reasoning? Why not trust God's way? Why not fear the LORD? Ladies, I encourage you to seek for true solutions to every question from to the only One who has full authority and power to answer correctly. Be still and take time to know... really KNOW the wisdom you desire. JESUS is the way... the only Way!! !